I obtained this figure from Chief Zaroff, a Topek Eskimo from Alaska, in the Eskimo Village at the St. Louis Exposition. The native name is Rote = a Mouth. Second: Pass the right index from above behind the string crossing the left palm, and as you draw the loop out, turn the right index away from you and upward (Fig. 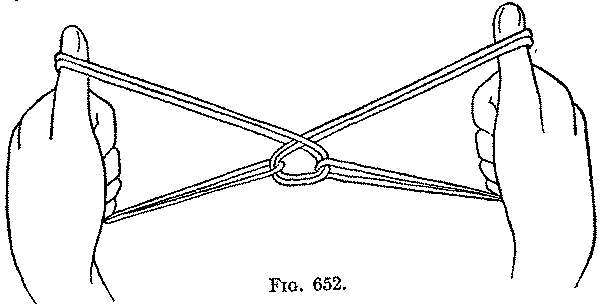 643), to put a cross in the loop, and also bend the left index down, and pick up from below on the back of the finger the left near little finger string, and return the index to its position (Fig. 644). 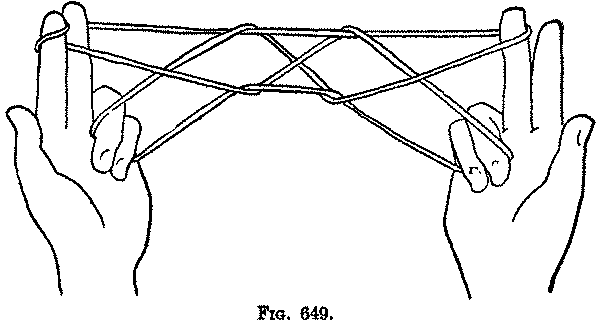 Release the loops from the little fingers (Fig. 645). You now have a loop on each index and a loop on each thumb. 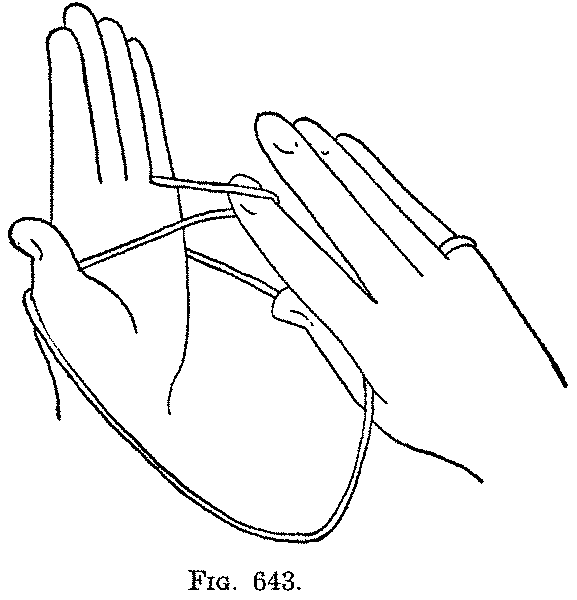 Third: Turn the palms toward you, and put the middle, ring and little fingers of each hand, from below, up into the index loop; then bend these fingers toward you down over the near index string, and draw the string down and hold it by closing the fingers on the palm (Fig. 646, Left hand). (Note the figure shows the figures holding the far index loop. This is incorrect.) Now put each middle finger from above into the thumb loop, and draw the far thumb string against the ring finger, closed on the palm, by closing the middle finger also down on the palm (Fig. 646, Right hand). 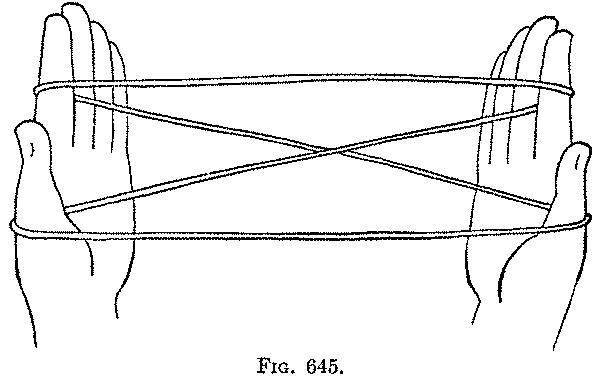 Fourth: Keeping carefully the string on each index, bend the index toward you over the near thumb string (Fig. 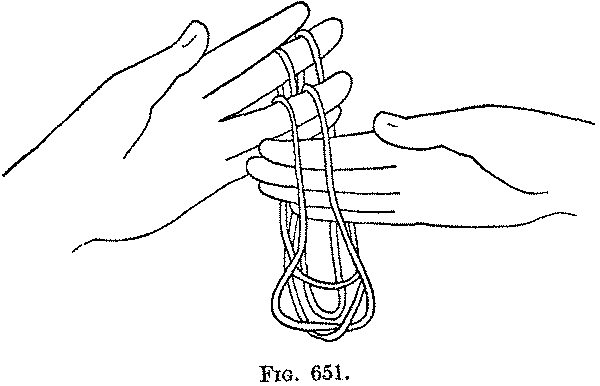 647, Left hand); then, by moving the index away from you and upward, lift up on the tip of the finger this near thumb string, while the string already on the index slips over the tip (Fig. 647, Right hand). 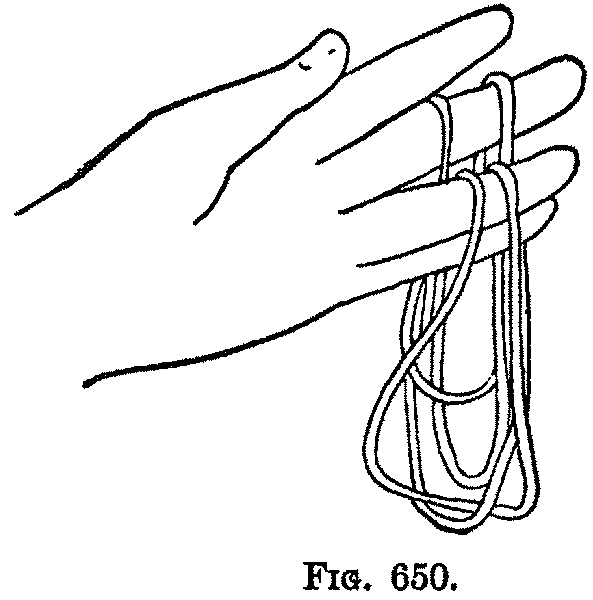 Fifth: Withdraw the thumbs from their loops, and let go the string held down by each middle finger (Fig. 648). You now have on each hand a loop around the index and a loop held to the palm by the closed ring and little fingers. Sixth: Transfer the index loops to the middle fingers, by putting each middle finger, from above, into the index loop (Fig. 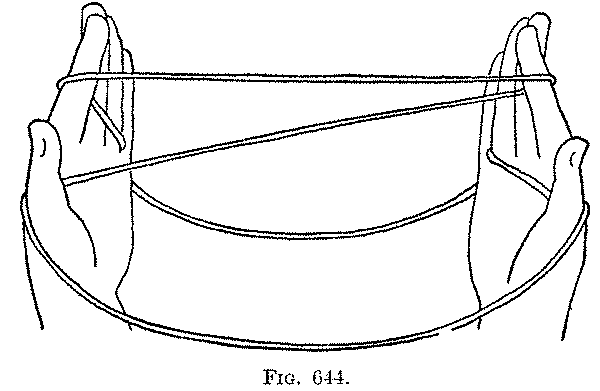 649, Left hand), withdrawing the index, and returning the middle finger to its position (Fig. 649, Right hand). Seventh: Bring the palms close together, and hang the right middle finger loop, without twisting it, over the left middle finger; and hang the loop held on the right ring and little fingers, without twisting it, on the left ring and little fingers; withdraw the right hand (Fig. 650). 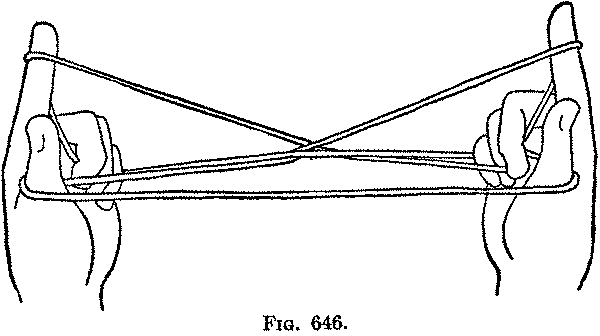 As I have already pointed out, the arrangement of the string into index and thumb loops, after the Second movement of this figure, differs from the almost similar arrangement after the opening in the "Bow," in that the two straight horizontal strings in this figure are both near strings, whereas in the "Bow" the upper straight string is the near index string and the lower is the far thumb string. 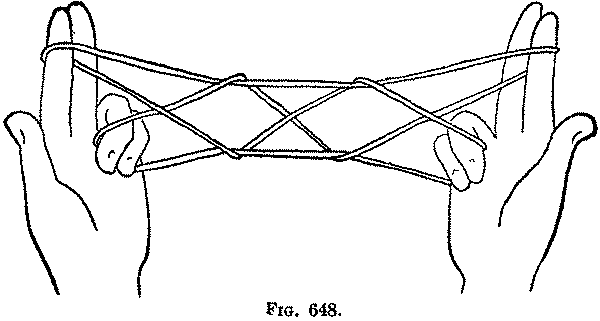 If, after Opening A, you release the little finger loops, you get a similar figure, but the upper straight string is the far index string and the lower is the near thumb string. I do not yet know of an instance in which, in a similar figure, both straight strings are far strings.